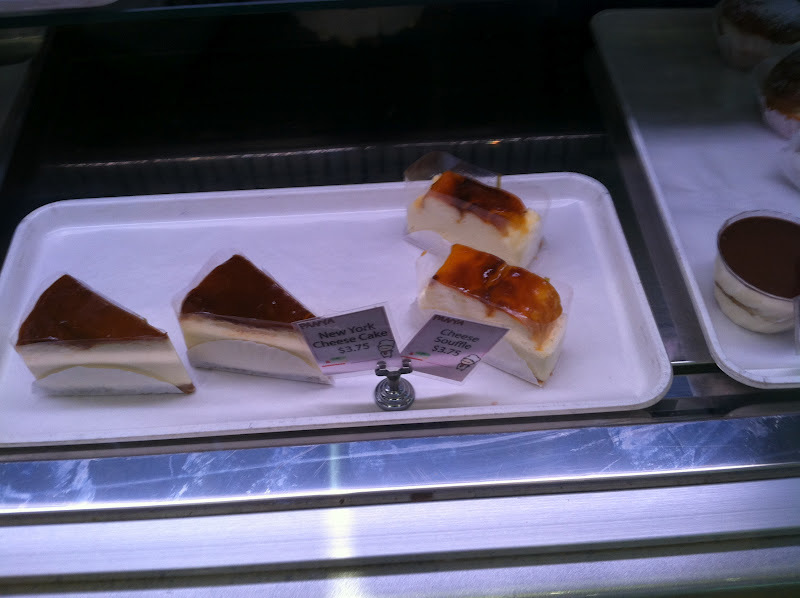 Earlier this week, I met up with old friend for lunch at Sunrise Mart. 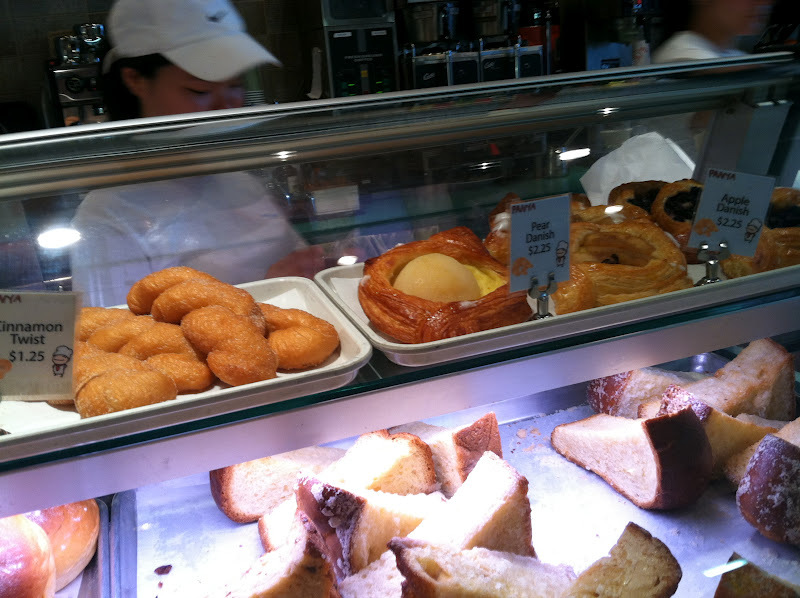 It's a hidden gem in the concrete jungle of central midtown, filled with pastries, hot foods, prepared foods, and a small grocery at the back. 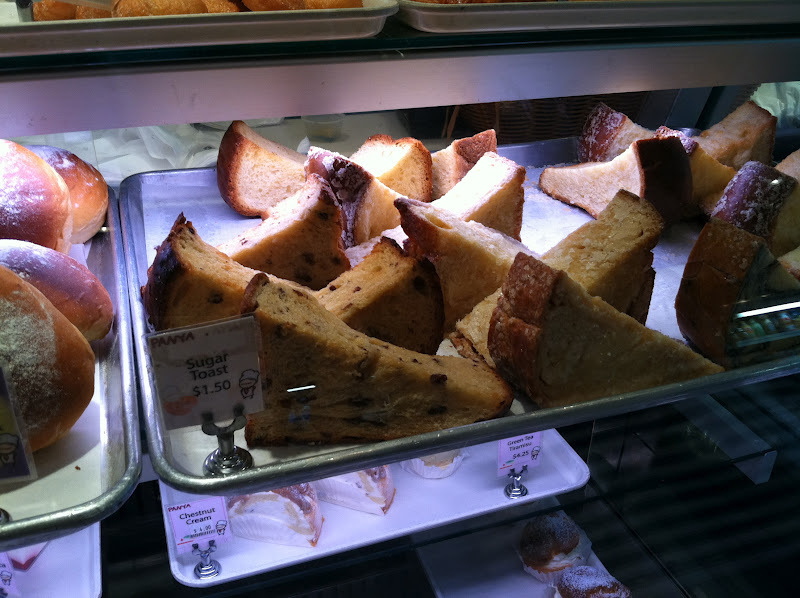 I really wanted to try one of their delicious-looking pastries, like this sugar toast dotted with raisins. It's $2 for a slice of sugar toast + coffee before 11am everyday. 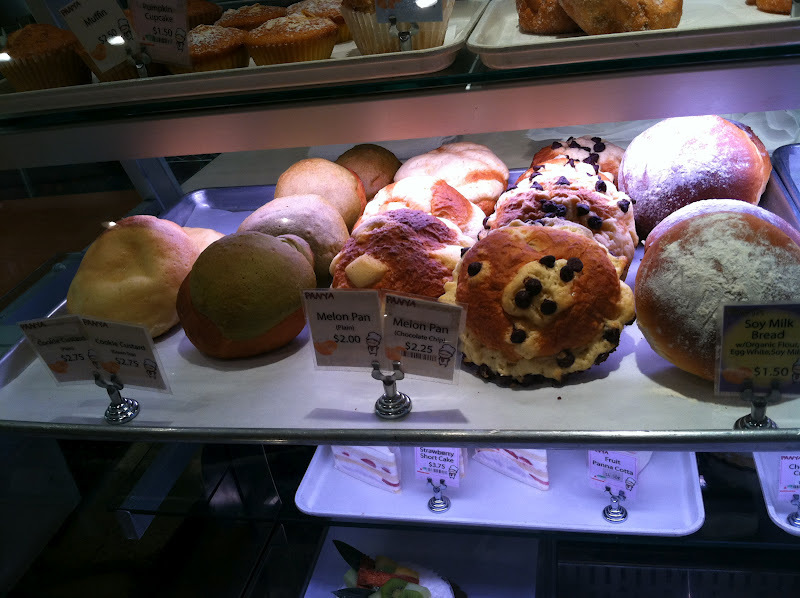 Or maybe a danish with half a pear aesthetically stuck on the bread. Their cheesecakes also look pretty enticing. But getting back to business - this was lunch after all. 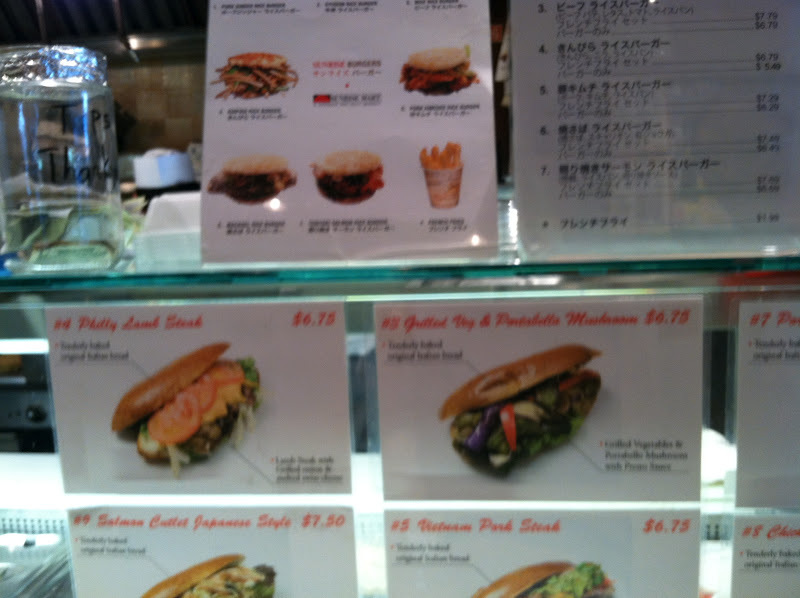 I was thinking of getting an udon, but was too tempted by their rice patty burger. 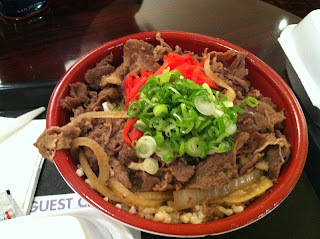 Hubby got a Gyu Don, which is rice topped with thinly sliced marinated beef and daikon simmered in mildly sweet sauce. 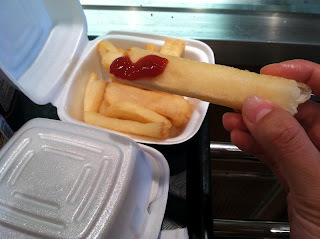 Being a potato head, I just had to - I mean had to - get their fries. 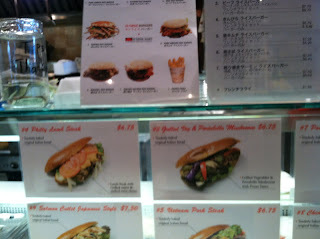 In the menu pictures, the fries were embedded in the burger, which I thought was really cool. But in reality, they give it to you in separate boxes. 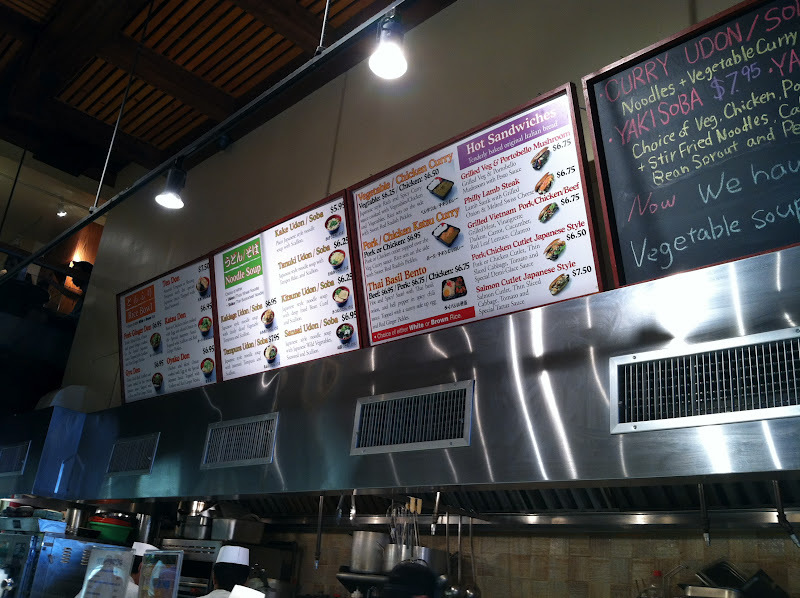 After 10 mins, my friend's Gyu Don finally came (they forgot about her order =(. It was a pretty big portion with loads of beef topped with a mountain of scallions and daikon that made it look like a Christmas-y feast. We dug right in. 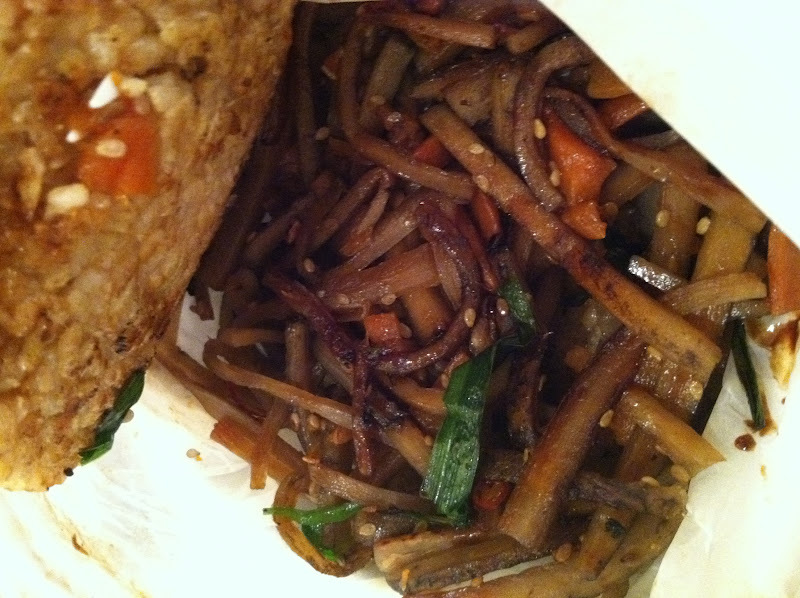 Apparently I ordered a fried radish, carrots, and veggie roots burger. But I was amazed by the taste of 1. the rice pattie and 2. the inside (which I wasn't exactly sure what it was). Both were pretty soy-saucy, especially the fried veggies. The inside looks like an assortment of veggies + sesame. 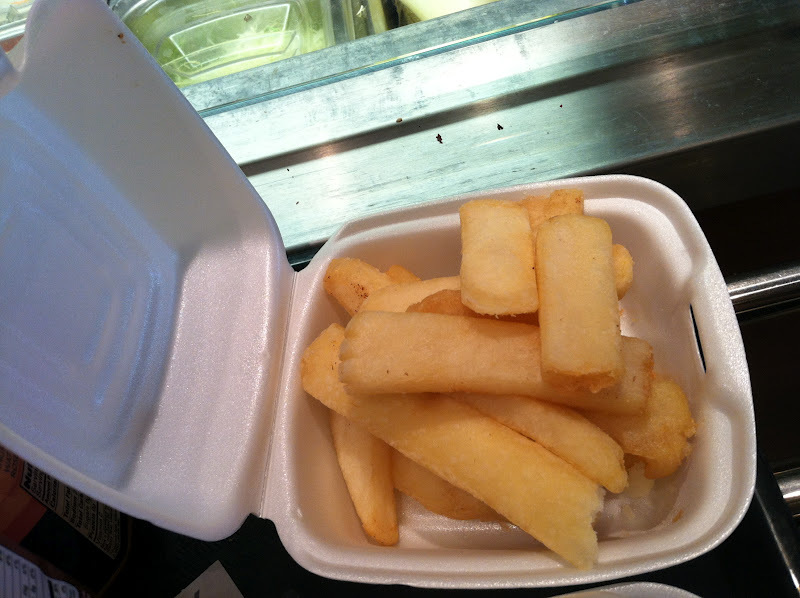 I still loved it despite it being pretty salty at times because it was uber addictive. 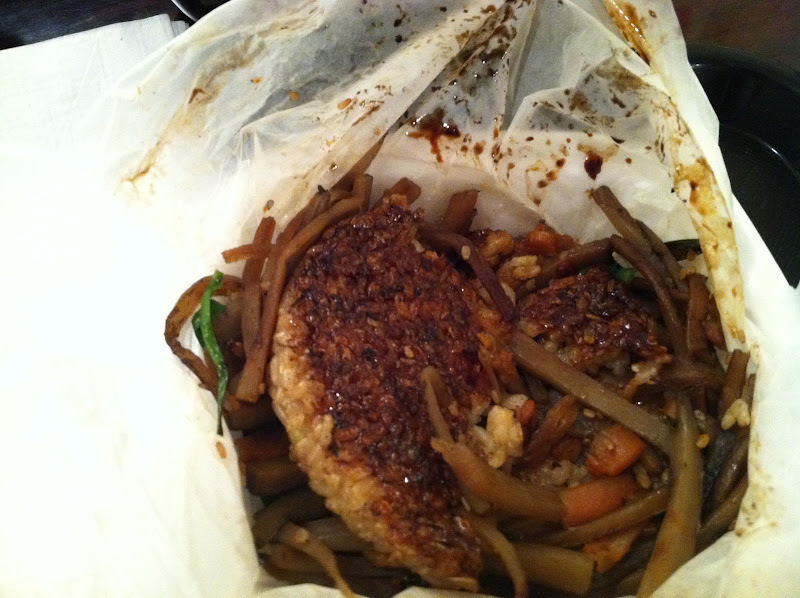 The rice pattie had an almost crispy coating of soy sauce, which made it at once appealing to the tastebuds. Hubby's Gyu Don was pretty nice too. 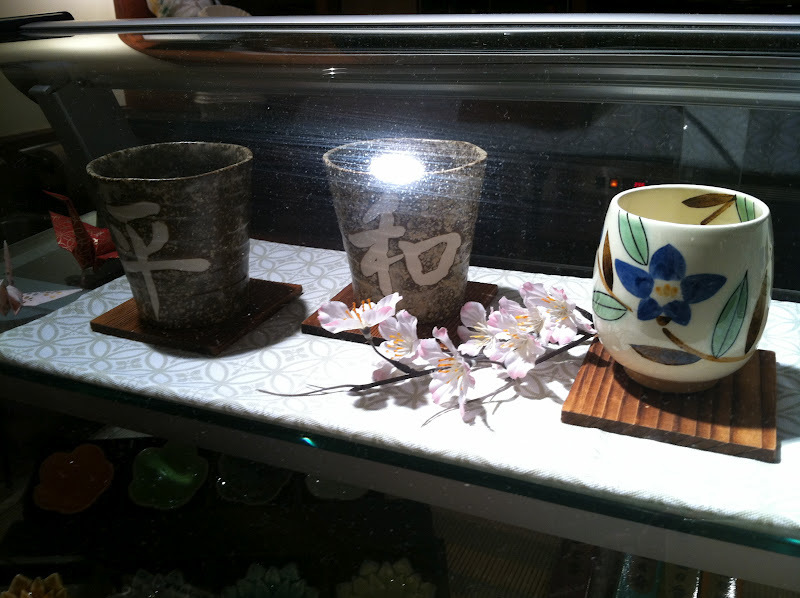 She got brown rice with it - it's optional between brown or white rice. 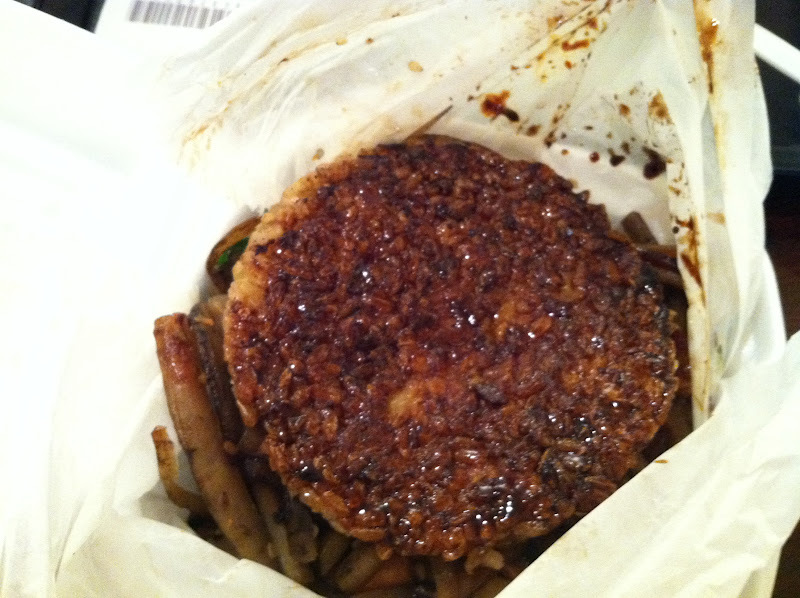 The flavor wasn't as strong as the burger, and the meat was quite tender. 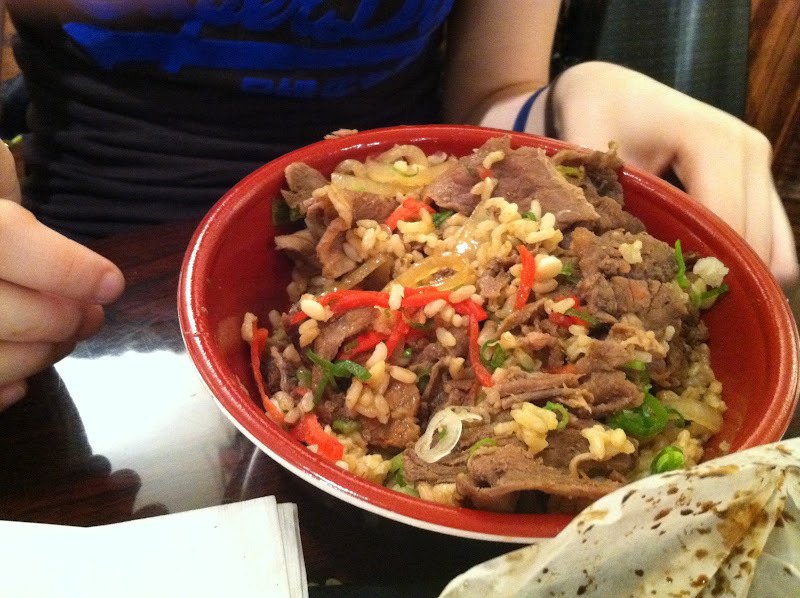 Especially after you mix it, the rice and scallions blend in nicely to add substance and flavor to the beef. 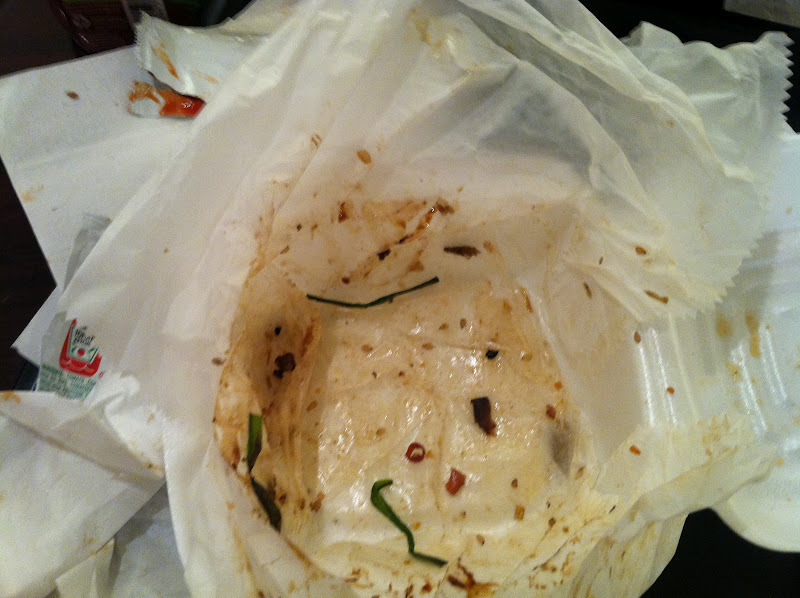 I finished all of my burger (with some help from my friend because we shared both the dishes). The pattie became a little too dry after being grilled to stay compact, but I still really really enjoyed it. We sat in the upstairs lounge of Sunrise Mart that carried this little display of tea sets which I thought was quite Zen. 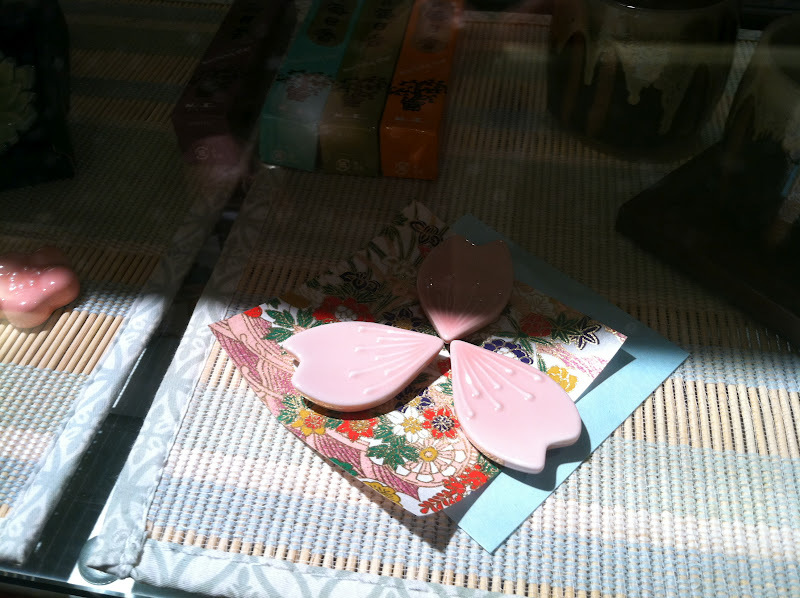 Really want to get these ceramic flower petals that can be used for chopstick holders. 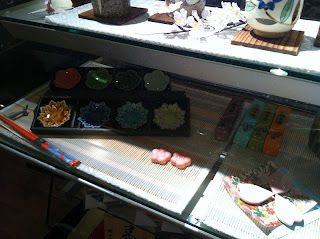 On our way back, my friend wanted to get some treats for her sister. 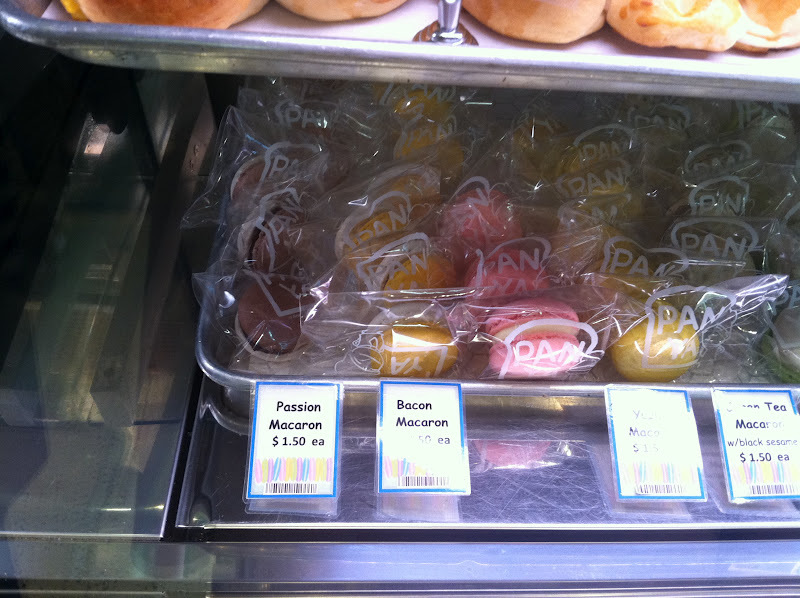 She got some melon pan, their signature pancake with oysters and shrimp, and macaroons. These macaroons come in a wild array of flavors - she got the bacon, green tea and cassis flavors. Next time I'd like to try their noodle sandwiches, which are basically yakisoba stuffed inside bah-mi buns. 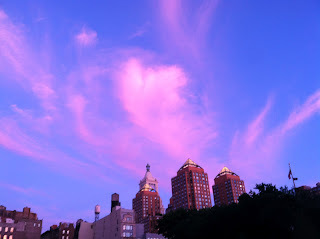 Later that day, I caught sight of this magenta cloud during sunset in Manhattan. Guess this really is the city that never sleeps - the sun rises during lunch, and remains bright and beautiful even during sunset.